Quads will be burning, lungs will be heaving, and those afraid of heights will be terrified. The forests of North America have long been the backdrop for tales of mythical beasts, but one real-life monster has been laying dormant, nestled in the forest of Michigan’s upper peninsula, for over 20 years. And no, it’s not Bigfoot. 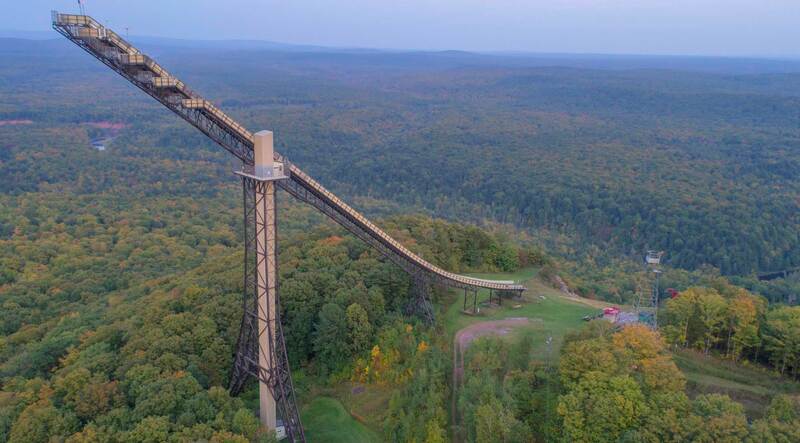 The beast in question, a ski-flying jump known as Copper Peak, is a 241-foot-tall ramp that was constructed from 300 tons of steel back in 1969. It was, and still is, the world’s largest artificial ski jump tower, although it only had a relatively short stint as a functioning ski jump. In its prime, elite athletes from around the globe sped down at speeds upward of 65 miles per hour, executing jumps reaching about 500 feet. Now, the beast is rising from its slumber. Copper Peak is on its way to becoming a functioning ski jump again, thanks to the International Ski Federation's (FIS) decision to authorize summer ski jumping events at the venue, according to Bob Jacquart, fundraising co-chair and re-development coordinator at Copper Peak. That's a work in progress, but the monstrous jump is back in action for an athletic competition far removed from its original purpose: Adventure-seeking athletes are set to run 400 meters up the 35-degree incline that ski jumpers would typically speed down. The event is called the Red Bull 400. And while the distance sounds harmless enough, even most elite runners only manage to finish it in over four minutes. (On a flat track, the same stretch would take less than one.) At Copper Peak, Berger expects the fastest times to hover around four and a half minutes. But unless you see it for yourself, it's tough to get a good idea of why his prediction is so generous. "Copper Peak is surprisingly monstrous to everybody," Jacquart says. "It’s something that you really have to see to understand. You go up an 18-story elevator, and you need to walk up the remaining six stories to get to the very top...You can’t imagine how big it is and how spectacular this structure is." When Jacquart took three Red Bull employees up the jump to inspect the venue, one couldn't even bear to ascend those last six stories. It's unique from most other ski jumps, which are typically built on mountainsides. And while there are other artificial jumps like Copper Peak, it takes the cake as the most gigantic. The race itself is the brainchild of former Olympic sprinter Andreas Berger, who was struck with the inspiration while driving past a ski jump in Austria back in 2011. He and his wife managed to make it to the top, and seven years later, his unassuming ascent is a mainstay in Red Bull's roster of adventure races. In 2018, the season features 17 locations worldwide, each more breathtaking than the last. For Copper Peak, the Red Bull 400 is the first event in a much greater revitalization of the historic jump. It’s the first athletic competition to take place there since 1994, and it’s happening in the midst of a multimillion-dollar project to have the jump FIS-approved for future skiing competitions. If you can stomach the heart-stopping height of the original jumping platform, you're in for an unparalleled 360-degree view of 40 miles. "It's going to be painful when you run up the jump, but you'll be so happy once you reach the top," Berger says. "It makes this race the perfect mixture of pain and happiness." Check out the video below for an even better idea of the challenge athletes will be taking on at Copper Peak on May 12.